After the heavy collision of the Swiss flagged river cruise ship "Edelweiss" (MMSI: 269057441), with the loaded "Forenso", 1285 ts (EU-No. 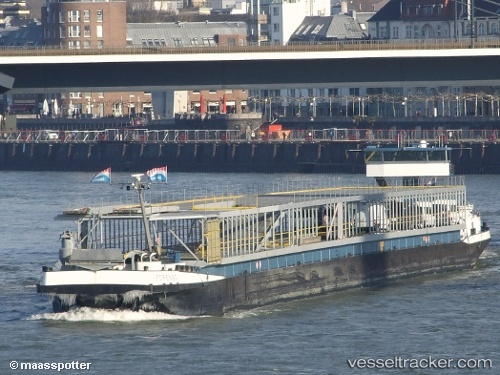 : 02324437;), on the Waal at the railroad bridge near Nijmegen on March 20 at 4 a.m., the "Forenso" could leave the Waalkade in Nijmegen after the removal of twisted debris from its bow at 6.10 p.m. It resumed the voyage to Colonia where it was due to arrive o March 21. The "Edelweiss" remained at the emergency berth in the Weurt West Canal where the baggage of those passengers who intended to continue the cruise westward was transferred from the heavily damaged "Edelweiss" onto the Swiss river cruise ship "Oscar Wilde" (MMSI: 269057612) which sailed at 11 p.m. towards Amsterdam, where it arrived on March 21. 12 passengers who wanted to abort the cruise were carried on by coaches. The police of Nijmegen continued its investigation which was expected to be finished within around two months.